This map represents the 3 main upper respiratory tract infections which are: otitis media, rhinosinusitis, and pharyngitis. 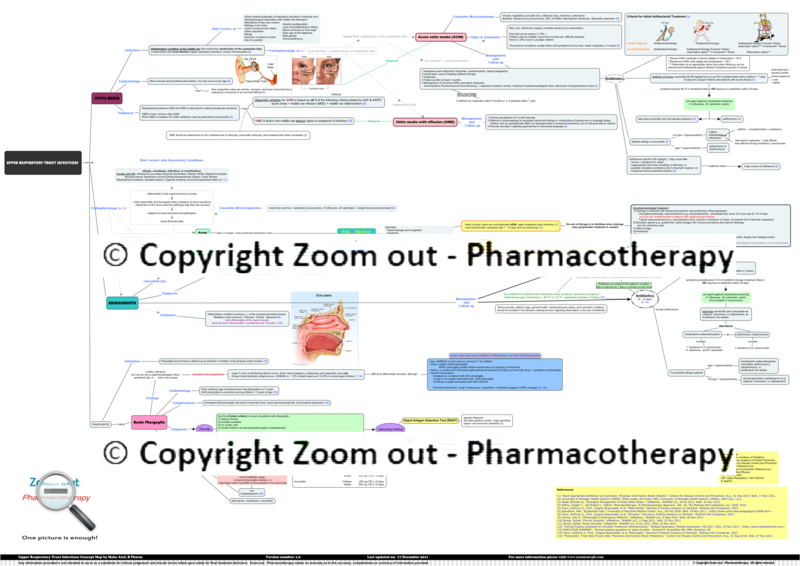 For each disease, the map links between pathophysiology, causative microorganisms, how to differentiate between viral and bacterial infections, and how to manage bacterial infections using antibiotics. The aim of this map is to direct clinicians towards better antibiotic use in order to avoid microbial resistance to antibiotics. 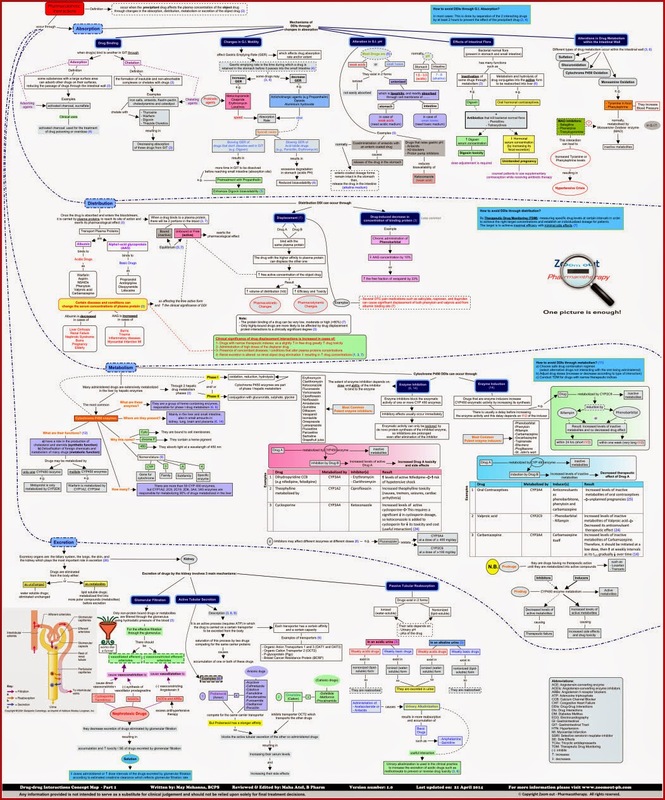 This map starts by risk factors and associated conditions of rhinosinusitis that lead to inflammation of the nasal and sinus mucosa and finally to acute rhinosinusitis. This is followed by possible factors for developing chronic rhinosinusitis. Some signs and symptoms are stated to help differentiating between viral from bacterial rhinosinusitis. Nonpharmacological treatment of rhinosinusitis facilitates sinus drainage and relieves symptoms. Regarding acute bacterial rhinosinusitis, nonsevere cases could be observed for 7 days with administration of nonpharmacological treatment. On the other hand, moderately severe to severe cases should be treated using antibiotics. This part concentrates on acute pharyngitis, the main etiology is infectious, including mainly viral infection and to a smaller extent infection by Group A beta hemolytic streptococcus (GABHS). Although, it is difficult to differentiate clinically, there are some signs that might be helpful to differentiate viral from GAS pharyngitis. Diagnosis of pharyngitis depends on the 4 Centor criteria, Rapid Antigen Detection Test (RADT), and Throat Culture. Management of viral pharyngitis doesn’t require antibiotics. Antibiotics (penicillin, or erythromycin for a penicillin-allergic patient) are necessary in managing GAS pharyngitis in order prevent acute rheumatic fever. 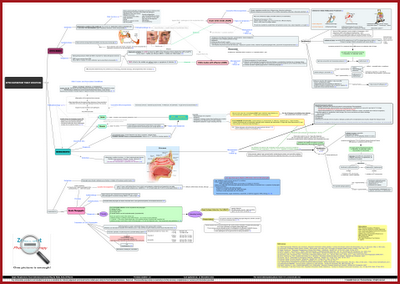 We hope you find Upper Respiratory Tract Infections Concept Map helpful. You can access part of the map for free through this link. But if you want to order it as a folded map, whole map or a printable version, then you can order below.